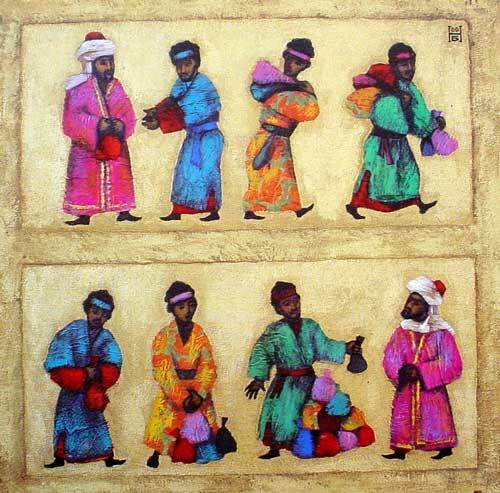 "The Three Servants" by Kazakhstan Artist Nelly Bube. The parable of the Pounds, Luke 19:12-27, is similar to this parable. But the differences are as great as the similarities. Form and redaction critics in our day claim that either the Christian Community or Luke (or whoever wrote Luke, they say) rewrote or redacted the parable of the talents for a theological purpose. Of necessity this denies the historicity of Jesus' speaking Luke 19:12-27. But these two parables clearly differ as to audience, time, locale, occasion and substance. The simple truth is that Jesus spoke two parables on two different occasions in two different settings for two different purposes. Like any good teacher Jesus used the same illustrations again and again in His teaching. verses 24-30: The accounting of the lazy servant. The first two sections each contain five verses. But the third has seven verses. This alerts us to the fact that this parable is primarily an instance of what we call the second use of the Law. Again and again in the Book of Concord this use of the Law is summarized with the words: Lex semper accusat, which means, The Law constantly convicts (us). The parable is meant for serious self-examination. Matthew 25:14 Again, it will be like a man going on a journey, who called his servants and entrusted his property to them. 15 To one he gave five talents of money, to another two talents, and to another one talent, each according to his ability. Then he went on his journey. 16 The man who had received the five talents went at once and put his money to work and gained five more. 17 So also, the one with the two talents gained two more. 18 But the man who had received the one talent went off, dug a hole in the ground and hid his master's money. The entire parable explains verse 13 of the previous parable. The parable is really about constant, responsible watchfulness. The KJV and NKJV rightly translate: "For the kingdom of heaven is like etc." This verse pictures Jesus entrusting the work of the Kingdom of grace to the Church when He ascended into heaven. Verse 15 pictures the assigning of individual gifts to individual persons. The parable is speaking about the visible Christian Church. Fahling: Since one talent was worth six thousand denarii, it covered a day's payroll for an army of six thousand men, a denarius being the equivalent of a day's wages for a laborer or a servant. Hendriksen: An attic talent amounted to no less than six thousand denars. It would take an ordinary laborer almost twenty years to earn one. And a footnote in the RSV: "This talent was more than fifteen years' wages of a laborer." The talent was a very large sum of money. The spiritual, mental, physical and psychological gifts which God apportions to the individual Christian are priceless and precious. Our Lord gives no one more than he can handle nor less than his ability requires. The distribution is truly manifold. One observes this everywhere in the Church. And one is amazed to find great and exceptional gifts even in small towns and so-called backward areas. "Went on a journey" indicates Jesus' ascending into heaven. The first wasted no time. It's like the disciples returning from the Mount of Ascension, busying themselves with the Lord's work. They put their gifts to work. And they gained one hundred percent. The second man acted just as did the first man. He also gained one hundred percent. But the difference between the first and second reminds us of the principle laid down in 1 Corinthians 12: 11: "But one and the same Spirit works all these things, distributing to each one individually as He wills." (NKJV). I have gifts which others may not have. They may have gifts which I do not have. And the amount may differ too. God does not expect me to work beyond my own capabilities. But he does expect me to listen to the words: "Be faithful until death." Revelation 2:10 NKJV. Now the talent is called "money." People bury things which they wish to hide or consider dead. Lenski: The talents gained are the graces and the gifts found in others whom we win for the church and whom we help forward in their Christian life. There is a constant extension and multiplication of gifts in the church, talent producing talent. The work which is done by the talents which God gives Christians is as wonderful as the multiplication of the loaves and fish in the hands of Jesus when He fed the 5,000. This slave regarded the gift as something he did not desire; it aroused no response in his heart. True. He despised the gift. How awful! Matthew 25:19 After a long time the master of those servants returned and settled accounts with them. 20 The man who had received the five talents brought the other five. "Master," he said, "you entrusted me with five talents. See, I have gained five more." 21 His master replied, "Well done, good and faithful servant! You have been faithful with a few things; I will put you in charge of many things. Come and share your master's happiness!" 22 The man with the two talents also came. He said, "You entrusted me with two talents; see, I have gained two more." 23 His master replied, "Well done, good and faithful servant! You have been faithful with a few things; I will put you in charge of many things. Come and share your master's happiness!" In application this denotes the time between the Ascension and the Parousia or death. Modern translations render the following words with "the Master of those slaves (servants)." The first offers the Master is twice as much as he received. Note the order of words in what he says: "Master, five talents to me you have entrusted. Look! Five other talents I've gained." This same joyful exuberance is found again in verse 22 but is conspicuously absent in verses 24-25. Fahling: 'Behold!' as if inviting him to count the money. Lenski rightly calls attention to 1 Thessalonians 2:19 at this point. There Paul says: "For what is our hope, or joy, or crown of rejoicing? Is it not even you in the presence of our Lord Jesus Christ at His coming?" (NKJV) Yes. The day of accounting for the faithful child of God will be a day of joy and rejoicing. Now the Master's response in verse 21. "Well done!" We suggest: "good, namely faithful." In what sense is a Christian good? Not morally, because both the Old Testament and the New Testament say that man is not good. Compare Psalm 14:1-3 and Romans 3:10-12. No man is good but only God is good. Matthew 19:17. Even Christians must confess that in their flesh dwells no good thing. Romans 7:18. In Scripture only the "works" of Christians are called good, Ephesians 2:10, not their persons. They are righteous but only by imputation. The Bible does not require goodness of me. Christ is my goodness. But, the Bible does require me to be faithful. Revelation 2:10; 1 Corinthians 4:2. The contrast in this sections reminds one of Romans 8:18 and Philippians 1:23. Kretzmann: The master was highly pleased, not so much at the sum of money gained as at the faithful work of the servant. Fahling: It is not the money that is stressed, but faithfulness. Lenski: 'After a long time' seems almost like a hint to the Twelve that the Parousia would not come as soon as they might expect. . . . But this long time surely implies two things: the delay thoroughly tests out the faithful, and at the same time it gives the unfaithful a long period to repent and to amend. And now the final word: "Enter into the joy of your Lord." Modern translations render "Master" and that is correct for it is still part of the parable. But the translations of this command are interesting: AAT: "Come and be happy with your master." NIV: "Come and share your master's happiness." Lenski: The slave is rewarded beyond all deserts. . . . Jesus holds up this commendation to us in advance in order that we may ever keep it before our eyes and allow it to make us always faithful. . . . All these talents are only 'few things' just enough to try us out to see what kind of slaves we are. What then will the 'many things' be? They are here veiled by their multitude and their richness, partly because the imagery of the parable is so restricted, and partly also because our poor earthly minds cannot reach up to these coming heavenly glories. But here all the Lord's goodness and his grace appear; his one thought is our elevation and our joy. And he was to share in the returns of his labors by becoming, in a way, the partner of the master, and enjoying the fruits of wider usefulness. Fahling: With this expression the Savior directs the carnal minded disciples to heavenly things. Beautifully said. In difficult days these words are a great comfort to the beleaguered Christian. And in days when he is tempted by the lust of the flesh, the lust of the eyes and the pride of life, these words remind him of what is most important. Verses 22-23 are very similar to verses 20-21. They have much in common. But note well that the commendation and reward are the very same in both cases. If by the grace of God I am faithful to Him I can confidently rest in the thought that I will share His joy with Him forever. What more do I need? I do not have the same kind of gifts or the same amount of gifts as do other Christians. But, oh Lord, let me feel neither superior nor inferior toward anyone! Let me be faithful to the point of death. Matthew 25:24 Then the man who had received the one talent came. "Master," he said, "I knew that you are a hard man, harvesting where you have not sown and gathering where you have not scattered seed. 25 So I was afraid and went out and hid your talent in the ground. See, here is what belongs to you." 26 His master replied, "You wicked, lazy servant! So you knew that I harvest where I have not sown and gather where I have not scattered seed? 27 Well then, you should have put my money on deposit with the bankers, so that when I returned I would have received it back with interest. 28 Take the talent from him and give it to the one who has the ten talents. 29 For everyone who has will be given more, and he will have an abundance. Whoever does not have, even what he has will be taken from him. 30 And throw that worthless servant outside, into the darkness, where there will be weeping and gnashing of teeth." In form verses 20, 22, and 24 begin in the same way. What the lazy servant says is well-nigh a speech as opposed to what the others say. What he says is not a joyful offering but rather a lengthy excuse. TEV and JB renders "sir." AAT and JB distinguish between "I knew" in this verse and "you knew" in verse 26. AAT has "I found out" for the former and "you knew" for the latter. JB reads "I had heard" and "you knew." That is a good observation. "Knew" does not denote what he knew on his own but rather what he knew by hearsay. Here it denotes lack of conviction and, in application, lack of faith. All our versions consistently render "hard." Fahling understands it as "hard to please." Lenski: "hard in a moral sense, is set absolutely on obtaining his own advantage." Hendriksen offers a number of synonyms: "unrelenting, harsh, merciless, stern, one who exacts more than he has a right to exact." Tasker quotes McNeile: "a hard moneymaking Jew who enriched himself at the cost of others, gathering gain where he had not spent ." Of course, what he had learned by hearsay was not true. "And therefore, because I was afraid." Tasker says: What he had done was to treat it as a dead thing, which like all dead things was better buried! Ylvisaker: In the parable, he who has received the least buries his treasure, but in our daily experience it is often times they who have received the most. . . . How many there are who vitiate and destroy the glorious gifts with which they are endowed of God. Kretzmann: He tried to put the blame upon the master. He believed the master to be hard, avaricious, grasping, ungenerous, with no love and reward for his servants, who were forced to slave and toil unremittingly to increase his gains, without receiving any share in the harvest which their hands produced. What he finally says to his master is in keeping with his estimate of his master. AAT reads: "There's your money!" NEB has: "Here it is--you have what belongs to you." Ylvisaker: But he was given not only to indolence, but also to ill will and animosity. This is evident in his entire speech, particularly in his closing word: 'There thou hast that is thine. Hendriksen: You should be thankful that I kept it intact, and that I now return to you whatever is yours. The lazy servant cannot (and is not allowed to) say more. Just as he had made a lengthy speech, his master answers him in kind. This situation is eschatological. All mercy has ceased. He is addressed with words that are as frightening as were the words to the first two comforting. He is called "actively evil" in the sense of "lazy." He is not accused of sins of commission but sins of omission, not of evil works but of dead works, not of wrongs committed against God and neighbor but of right things which he failed to do. Note that what follows is in the form of a question: "So you knew, did you, that I harvest etc." What he says now proves that the man is lying or, if not that, then at least that he is illogical, cannot think straight. "Wasn't it, therefore, necessary that you turn my money over to the bankers and, when I had come, I would have gotten mine with interest?" Tasker: The master's point is that the servant, believing as he did that it was ought to have been all the more concerned to see that he had something more to bring to him on his return from abroad than the one bag of gold he had received! Ylvisaker: When the servant refused to act independently in the work of his calling, he should have subordinated himself to others, and allowed them to take him into their service. Fahling: What he said in defense of his conduct was preposterous. Hendriksen: A safe inference would seem to be that Jesus is not opposed to responsible capitalism. Tasker: The Greek word 'interest' means 'offspring'. Interest is the 'child' of capital. In other words, this man's activity was fruitless. Faith without works is dead. "In view of your attitudes." The point of verse 28 is the loss of everything. His works do not follow him. He will not hear the words "Well done!" Jesus repeats a principle which is found several times in the Gospels. Consult the passages at Matthew 13:12. The first half of the axiom denotes God's gracious blessedness on the attitudes and actions of the faithful believers. But the second half denotes God's awful curse on the attitudes and omissions of the fearful, lying, lazy, faithless unbelievers. But more. In verse 30 he is called "useless." The words are obviously addressed to the angels: "Throw him out into the outer darkness. "Not just darkness but outer darkness. The place where all mercy has ceased. The final sentence denotes the place of remorse, regret and despair. That place is everlasting damnation. What a text for self-examination! Lord, is it I? For Jesus' sake forgive my fears, my lies, my uselessness. Adapted from Exegetical Notes, Series A Matthew-John Sundays After Pentecost Gospel Texts, by Harold H. Buls, Concordia Theological Seminary Press: Ft Wayne IN, 1981, pp. 91-94. Used with permission.